Dirk Nowitzki has quietly visited patients at Children’s Medical Center in Dallas, but never allowed those visits to be publicized. As his retirement appears eminent, people are opening up about the magic he brings to each family he meets. DALLAS — “I mean they have tons of different games here. You can play Xbox or Wii,” said Evan Jurgensen, sounding like a tour guide. “Over here is where kids can do crafts,” he said. Evan knows every inch of the Child Life Zone on the fifth floor of Children’s Medical Center in Dallas. You learn a place when you live there almost two years. “I think of this as like my second home,” he said. Evan is 11 years old. He spent the better part of 24 months in the hospital battling and eventually beating cancer. Twice. Evan Jergensen is now cancer free. He is a straight-A student in a Frisco middle school. The 7-foot-tall Santa quietly comes to the hospital every Christmas. Celebrity visits are common here, but no one does it like Dirk Nowitzki. No entourage. No publicity allowed. Nowitzki brings a photographer from the Dallas Mavericks so he and the families can have mementos. But, except for one rare occasion when The Dallas Morning News documented his visit, news cameras were never allowed. “It’s unheard of. Nobody does that,” said Keri Kaiser, chief marketing officer and chief experience officer for Children’s Health. Keri is one of the few employees who have been able to watch the magic happen room after room, year after year, child after child. Kaiser is responsible for marketing, but marketing is out the window when Nowitzki comes because he wants to visit in secrecy. Instead, Kaiser often follows behind the basketball legend, pushing a laundry cart loaded with presents specially purchased for the patients he’s planning to visit — patients selected by hospital staff. But he brings extra gifts for children he bumps into in the hall. Kaiser said Nowitzki often plans to spend two hours, but usually ends up staying for five. “Watching him when he does these visits is an absolute privilege,” she said. She admitted she woke up Tuesday feeling “incredibly emotional” at the thought of it being the day of his final game in Dallas. Evan cherishes the silver Beats headphones Nowitzki gave him during a visit he'll never forget. More than two years later, the headphones still look pristine — not a scratch. “I mean, every time I always think of how I got them, every single time, I think of Dirk,” he said. 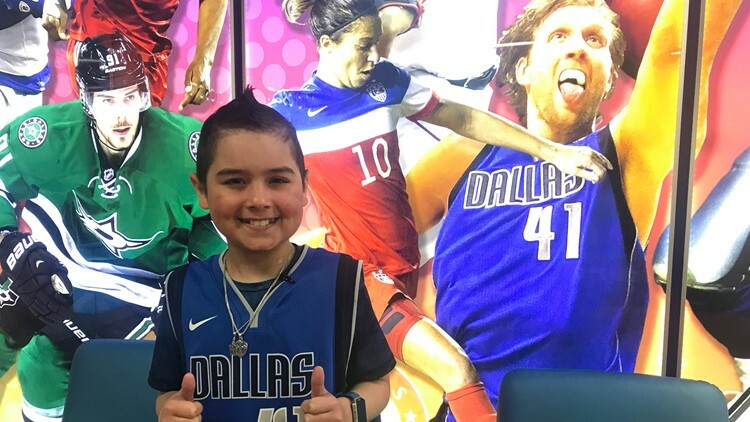 Nowitzki’s surprise visit to Evan’s room came as a medical team was waiting in the hall to transport him to yet another painful surgery. But Nowitzki has a way of forging deep personal connections that make even scared kids smile.